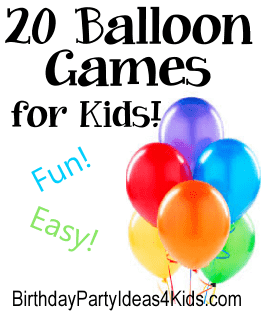 Fun balloon games for kids parties! are great for kids birthday parties! Easy and fun for kids ages 3, 4, 5, 6, 7, 8, 9, 10, 11, 12, 13, 14, 15, 16, 17 and 18 year old to play. *Remember to keep popped balloon pieces away from kids of all ages. Clean up any broken pieces right away. Give each child a balloon. See who can balance their balloon on their finger the longest without it losing contact with their hand. Then see who can balance a balloon on the end of a pool noodle the longest. Divide the guests into two teams and give each guest a blown-up balloon. Have the guests get into one line and put their balloon between their stomach and the back of the person in front of them (so everyone in the line is connected). Once everyone has set up, have the line leaders start walking their lines around the room. The line leaders can touch their balloons with their hands, but no one else can do so. If anyone drops their balloon, that person is out. Once the lines have walked around for a while, have an adult yell ‘smash!’ When this happens, the guests try to pop their balloons by running into the back of the person in front of them. There isn’t much of a winner to this game, it’s just really fun to play and watch! Tie a long string in-between two tall objects outside, such as a tree and a fence. Fill some of the balloons with water, some with candy, and some with nothing. You can also fill some with other small objects that you have around. Hang the balloons from the string and spread them out. Blindfold the first child, spin them around, and bring them to the balloons. Give them a bat or other object and tell them to swing at the balloons until one breaks. If the child is lucky, they will get candy, but if hit the wrong one, they’ll get wet! Blow up twenty to thirty balloons and set them in the middle of the room. When the game begins, have the children sit on the balloons and pop them. Make sure that they collect the popped balloons as soon as they pop them. When all of the balloons have been popped, count up each child’s collection of popped balloons. Whoever popped the most, wins! Tie a blown-up balloon to a string, and tie one balloon to each child’s ankle. On ‘go’, the children have to stomp on the other children’s balloons to try and pop them, while at the same time keeping their own balloon from being popped. Hands cannot be used to protect balloons, and the last child with a balloon still intact wins! This can be played as a relay, or every child can go at the same time. Designate a starting and ending line. Give the child an empty balloon. Have the child blow up the balloon, then let it go in the direction of the finish line. The child then goes to wherever the balloon landed, picks it up, blows it up again, and lets it go. Whoever gets his/her balloon across the finish line first wins! Divide kids into two teams, relay style. Put balloons and disposable diapers on the other side of the room. When the game starts, have a child from each team run from the starting line to the balloons. Have the child put on a blindfold and then put one of the diapers on a balloon. When they have finished, have them take off the blindfold, run back to their team, and tag the next player to go. The first team to have all of their players diaper a balloon and get back to the starting line wins! Give each child a blown-up balloon and designate a start and finish line. On the word ‘go’, each child must hit his/her balloon in the air and hit it to the finish line. If the balloon touches the ground, the child must go back to the start. No holding the balloon allowed! The first child across the finish line wins! If you want to make this game harder for older children, the referee can call out different positions for the child to compete in, such as crab walking or hopping on one foot, or have the children only hit the balloon with their heads or their feet. Blow up at least one balloon for each child. Give each child a funnel. Have the children toss the balloons in the air and try to catch them in the funnel. This game can go on for as long as the kids are having fun! This game requires a little more set-up, but it is hilarious. Gather up four carpet dollies, four laundry baskets, and lots of smaller balloons. Divide all guests into four teams and put them in the four corners of the room. Put all of the balloons into the center of the room. Tie a rope onto the end of each carpet dolly that is long enough to reach from a team to the middle of the room. Designate one member from each team to be a ‘hippo’ and have them lie on their stomachs on their carpet dolly. Give the hippos a laundry basket. On ‘go’, have the team members push their hippo on the dolly into the center of the room. The hippo uses the laundry basket to capture balloons. Have the team members pull the hippo back, collect the captured balloons, then push the hippo back out. Continue this until all of the balloons have been captured. The team with the most balloons wins! Divide guests into two teams. Give each team an oversized pair of sweatpants and a big sweatshirt, along with a package of balloons. Designate one person from each team to be Santa and have them put on the sweatsuit. When the game starts, have the rest of the teammates blow up the balloons and stuff them into their Santa’s clothing. When time is up, the Santa that is the fullest or that looks the funniest wins! Fill balloons with helium and attach them to the ground outside with golf tees. You want them to be spread out, but still in the same area and low to the ground. Write numbers on the balloons with a permanent marker, making the closer balloons worth less and the further balloons worth more. Give the first child a hula hoop and have them stand behind the line. The child then throws the hula hoop and tries to make it land over a balloon. The number on the balloon is the child’s score. Give the child three tries, then add up his/her score from each try to become his/her final score. After all of the children have had their turn, the one with the highest final score wins! Tie a long string to a balloon and hand it to a child. Have the child run around to keep the balloon off of the ground. See which child can keep the balloon up off of the ground the longest. You can shorten or lengthen the string based on how difficult you would like this game to be for the child. Give each child an empty balloon. Have them fill their balloons up with flour using a funnel. Once the balloon has been filled, tie a knot in the opening. You can have the children decorate their balloons, but be warned that markers will wear off. Remind the children to be careful with their balloons so that they do not pop. If you want, you can put their balloon inside of a second balloon to make it more secure. This makes a great party favor! Set up a simple obstacle course and have each kid get on his/her hands and knees. Have the kids try to blow the balloon through the course. You can also have the kids put their balloons in-between their legs and try to complete the course that way. Put several blown-up balloons on a white sheet and have all of the kids hold on to the edges of the sheet. Show the kids how to move the sheet up and down to make the balloons dance on the sheet. You can have one or two kids at a time go underneath the sheet to experience it from that angle. Don’t forget to have a kid be the designated ‘balloon picker-up’ for all of the balloons that fall off of the sheet! Blow up several pink balloons and draw pig faces on them. Designate a pig pen area and have guests uses either brooms or their feet to herd the pigs back into their pen. As the farmer, you can help the little pigs escape their pig again if you would like to do so. Blow up two or three balloons for each child playing and put a secret message in at least half of them. These secret messages should be simple and/or funny tasks for the children to complete, such as doing the chicken dance or doing jumping jacks. Have the children sit in a circle. One at a time, have each child sit (or stomp) on a balloon to pop it. If there is a secret message inside, they have to complete the task! Attach rulers to paper plates and give one to each child. Section off a playing area with tape or rope. Have the children hit the balloon over the center line to try and score on the other side. Pair the children up into pairs of two. Have the children stand face to face and put a balloon in-between them so that their stomachs are holding it in place. Have the pairs move from the starting line, to a designated spot across the room, and then back to the starting line without dropping the balloon. If a pair drops the balloon, they have to start over from the beginning! For more fun with balloon see our Water Balloon Games page! Over 50 fun games and activities for all ages!